John Watts Young (September 24, 1930 – January 5, 2018) was an American astronaut, naval officer and aviator, test pilot, and aeronautical engineer. He became the ninth person to walk on the Moon as Commander of the Apollo 16 mission in 1972. Young enjoyed the longest career of any astronaut, becoming the first person to fly six space missions (with seven launches, counting his lunar liftoff) over the course of 42 years of active NASA service. He is the only person to have piloted, and been commander of, four different classes of spacecraft: Gemini, the Apollo Command/Service Module, the Apollo Lunar Module, and the Space Shuttle. In 1965, Young flew on the first crewed Gemini mission, and commanded another Gemini mission the next year. In 1969 during Apollo 10, he became the first person to fly solo around the Moon. He drove the Lunar Roving Vehicle on the Moon's surface during Apollo 16, and is one of only three people to have flown to the Moon twice. He also commanded two Space Shuttle flights, including its first launch in 1981, and served as Chief of the Astronaut Office from 1974 to 1987. Young retired from NASA in 2004. He died on January 5, 2018. Young was born in San Francisco, California, on September 24, 1930, to parents William Hugh Young, a civil engineer, and Wanda Howland Young. At 18 months old, due to the Great Depression, he moved with his family to Cartersville, Georgia, then to Orlando, Florida, where he attended grade school and later Orlando High School until graduating in 1948. Young was a Boy Scout and earned the rank of Second Class. Young earned a Bachelor of Science degree with highest honors in Aeronautical Engineering from the Georgia Institute of Technology in 1952; while attending, he became a member of the national military honor society Scabbard and Blade and Sigma Chi fraternity. I got a telegram from the Chief of Naval Operations asking me not to do this anymore. —Young, describing an air-to-air missile test in which he and another pilot approached each other at Mach 3 - risking destruction of both aircraft. After graduating from Georgia Tech in 1952, Young entered the United States Navy through the Navy ROTC and was commissioned on June 6, 1952, as an ensign. He served as fire control officer on the destroyer USS Laws until June 1953 and completed a tour in the Sea of Japan during the Korean War. Following this assignment, he was sent to flight training. In January 1954, he was designated a Navy helicopter pilot. After receiving his aviator wings on December 20, 1954, he was assigned to Fighter Squadron 103 (VF-103) for four years, flying Grumman F9F Cougars from USS Coral Sea and Vought F8U Crusaders from USS Forrestal. Fellow astronaut Charles Bolden described Young and Robert "Hoot" Gibson as the two best pilots he had met during his aviation career: "Never met two people like them. Everyone else gets into an airplane; John and Hoot wear their airplane. They're just awesome". Young retired from the Navy as a Captain in September 1976, after 25 years. Joining NASA in 1962, Young was the first of the Astronaut Group 2 to fly in space, replacing Thomas P. Stafford as pilot of Gemini 3 when Alan Shepard, the original command pilot, was grounded due to Ménière's disease. Making the first crewed flight of the Gemini spacecraft with Gus Grissom in 1965, Young scored another space first by smuggling a corned beef sandwich onto the spacecraft—a feat for which he was reprimanded. Some members of the US House of Representatives were not pleased about the stunt, claiming that Young cost tax payers millions of dollars by disrupting a scheduled test of space food during the flight. Young then trained as backup pilot for Gemini 6A. The assignment of Gemini 7 backup command pilot Ed White to Apollo, created an opening for Young as commander of Gemini 10 in 1966. The mission was the first to perform a rendezvous with two Agena target vehicles; and his pilot, Michael Collins, performed two spacewalks. In 1966, Young was assigned to an Apollo crew as Command Module pilot, with Commander Thomas Stafford and Lunar Module pilot Eugene Cernan. This crew was assigned as backup to the second manned Apollo mission, planned before the Apollo 1 fire. After that fire, both crews[clarification needed] were assigned to the first actual manned mission, Apollo 7, which flew in October 1968. In May 1969, this crew flew to the Moon on Apollo 10. While Stafford and Cernan flew the Lunar Module in lunar orbit for the first time, Young flew the Command Module solo. Apollo 10 set the record for the highest speed attained by any crewed vehicle at 39,897 kilometres per hour (24,791 mph) during its return to Earth on May 26, 1969. 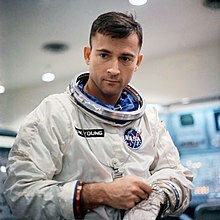 Young was backup commander of Apollo 13, the troubled mission in which the Moon landing was aborted because of an explosion in the Service Module. By rotation, Young became commander of Apollo 16, and studied geology with his crew while preparing for the mission. Apollo 16's lunar landing was almost aborted when a malfunction was detected in the SPS engine control system in the Service Module. It was determined that the problem could be worked around, and the mission continued. 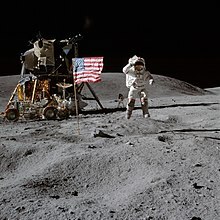 On the surface, Young took three moonwalks in the Descartes Highlands with Charles Duke on April 21, 22 and 23, 1972, making Young the ninth person to walk on the surface of the Moon, while Ken Mattingly flew the Command Module in lunar orbit. Young's final assignment in Apollo was as the backup commander for Cernan on Apollo 17. The backup crew was originally the Apollo 15 crew, but Deke Slayton removed them from the assignment when he learned they had taken a small statue to the Moon, as well as stamps that they sold to a dealer. In January 1973 Young was made Chief of the Space Shuttle Branch of the Astronaut Office. In January 1974, he became Chief of the Astronaut Office after the retirement of Alan Shepard. Young flew two missions of the Space Shuttle, both aboard the Space Shuttle Columbia. He commanded the program's 1981 maiden orbital flight, STS-1, and in 1983 commanded STS-9, which carried the first Spacelab module. In 1986 he was in line to make a record seventh space flight on STS-61-J to deploy the Hubble Space Telescope, but the Space Shuttle Challenger disaster earlier that year had delayed NASA's schedule. Young was openly critical of NASA management following the Challenger disaster, and in April 1987 was made Special Assistant to JSC Director Aaron Cohen for Engineering, Operations and Safety. NASA denied that his criticism triggered the move, although Young and industry insiders believed that was the reason for the reassignment. In February 1996, he was assigned as Associate Director (Technical) JSC. During his NASA career, Young logged more than 15,000 hours of training, mostly in simulators, to prepare for positions on eleven spaceflights in prime and backup crew positions. Young worked for NASA for 42 years and announced his retirement on December 7, 2004. He retired on December 31, 2004, at the age of 74, but continued to attend the Monday Morning Meeting at the Astronaut Office at JSC for several years thereafter. He logged more than 15,275 hours flying time in props, jets, helicopters, and rocket jets; more than 9,200 hours in T-38s; and 835 hours in spacecraft during six space flights. On April 12, 2006, Young appeared at the 25th anniversary of the STS-1 launch at the Kennedy Space Center Visitor Complex, along with pilot Robert Crippen. The two spoke of their experiences during the flight. In 2012, Young published an autobiography, Forever Young. Young married Barbara White of Savannah, Georgia, and they had two children, Sandra and John. They were divorced in 1972 after 16 years of marriage. He later married Susy Feldman, and lived in El Lago, Texas, a suburb of Houston. Young died on January 5, 2018, at his home in Houston of complications from pneumonia. He was 87. In October 2018, Northrop Grumman announced that the Cygnus spacecraft for their tenth cargo resupply mission to the International Space Station would be named S.S. John Young. Florida State Road 423 is named in his honor, as is John Young Elementary School in Orlando, Florida. Scott Kelly (an American astronaut who spent nearly a year aboard the International Space Station) had high praise for Young in his memoir, Endurance: A Year in Space, a Lifetime of Discovery. Upon learning that Young would interview him as part of his astronaut selection process, Kelly listed some of Young's more impressive achievements, and then stated simply, "He was what you might call an astronaut's astronaut, a living legend. I wanted to be just like him." In 1995, Young was inducted into the International Air & Space Hall of Fame at the San Diego Air & Space Museum. In 2001, Young was inducted into the Georgia Aviation Hall of Fame. John Young Parkway, a major highway in Orlando and Kissimmee, Florida, is named for him. When he heard the highway was named for him, he said "Them boys shouldn't a'done that. I ain't dead yet". An elementary school (OCPS) on the parkway also bears his name. The planetarium at the Orlando Science Center was originally named in his honor. Along with nine other Gemini astronauts, Young was inducted into the International Space Hall of Fame in 1982. In the 1995 film, Apollo 13, Young was played by Ben Marley. In the 1998 HBO miniseries, From the Earth to the Moon, he was played by John Posey. ^ a b c d e f g h i j k l m n o p q r s t u v w "Biographical Data: John W. Young (Captain, USN Ret.)". NASA. August 2010. Retrieved May 14, 2013. ^ Speck, Emilee (September 24, 2016). "Moon-walking astronaut John Young turned 86 on Saturday". Orlando Sentinel. Retrieved August 16, 2017. ^ "From Gemini to Shuttle: John Young Retires". NASA. December 7, 2004. Retrieved January 7, 2018. ^ Lewis, Russell (January 6, 2018). "Gene Cernan, Last Man To Walk On The Moon, Dies At 82". NPR. Retrieved January 7, 2018. ^ "Astronauts Could Have a Party". The Orlando Sentinel. Orlando, Florida. February 3, 1963. p. 15 – via Newspapers.com. ^ a b Goldstein, Richard (January 6, 2018). "John Young, Who Led First Space Shuttle Mission, Dies at 87". The New York Times. ^ a b c d "John Watts Young". Navy Office of Information, Biographies Branch. April 10, 1972. ^ "Astronaut John Young, One of Only 12 to Walk on Moon, Dies at 87". Fortune. Bloomberg News. January 6, 2018. ^ Associated Press (March 24, 1965). "John Young, as Early as 1946, Displayed Interest in Rockets". St. Joseph Gazette. 120 (238). p. 6A. Retrieved May 14, 2013. ^ "Biography: Education". JohnWYoung.org. Retrieved May 14, 2013. ^ "Scouting and Space Exploration". Scouting.org. Archived from the original on March 3, 2016. ^ a b Wasik, John W. (April 4, 1965). "Virgil Grissom and John Young: Our Trail-Blazing "Twin" Astronauts". Sarasota Herald-Tribune. Family Weekly. p. 4. Retrieved January 28, 2010. ^ Boswell, Blount, ed. (1952). Blue Print. 45. Georgia Institute of Technology. p. 108. ^ "Astronaut John W. Young - Navy Career". Johnwyoung.org. ^ a b "Commanded the first shuttle flight, the first person to enter space six times". New Mexico Museum of Space History. Retrieved January 6, 2018. ^ Bolden, Charles F. (January 6, 2004). "Charles F. Bolden". NASA Johnson Space Center Oral History Project (Interview). Interviewed by Johnson, Sandra; Wright, Rebecca; Ross-Nazzal, Jennifer. Houston, Texas. Retrieved January 6, 2014. ^ Thompson 2004, p. 366. ^ Zhang, Sarah (March 24, 2015). "50 Years Ago, NASA Astronauts Smuggled a Corned Beef Sandwich Into Space". Gizmodo. ^ Composite Air-to-ground and Onboard Voice Tape Transcription of the GT-3 Mission (PDF). National Astronautics and Space Administration. April 1965. p. 45. Retrieved May 14, 2013. ^ "Gemini 6 Back-up Crew". NASA. March 23, 2008. Retrieved January 6, 2018. ^ Evans, Ben (August 14, 2010). Foothold in the Heavens: The Seventies. A History of Human Space Exploration. Springer Science+Business Media. p. 151. doi:10.1007/978-1-4419-6342-0. ISBN 978-1-4419-6341-3. ^ Lunsford, Christine (September 18, 2017). "Gemini 10: NASA's Epic 1st Double Rendezvous Mission in Photos". Space.com. Retrieved January 6, 2018. ^ "Gemini 10". NASA Space Science Data Coordinated Archive. Retrieved January 6, 2018. ^ Glenday, Craig, ed. (2012). Guinness World Records 2012. Bantam Books. p. 322. ISBN 978-0-345-53437-8. ^ Lloyd, John; Mitchinson, John (2010). QI: The Book of General Ignorance (The Noticeably Stouter ed.). Faber and Faber. p. 280. ISBN 978-0-571-27378-2. ^ "Apollo 13 Crew". Smithsonian National Air and Space Museum. Retrieved January 6, 2018. ^ Dickie, Allan (July 7, 1971). "Astronauts training in Ont". The Leader-Post. Regina, Saskatchewan. The Canadian Press. Retrieved November 26, 2011. ^ "Descartes Surprise". Apollo Lunar Surface Journal. Retrieved November 26, 2011. ^ "Apollo 16". NASA. July 8, 2009. Retrieved January 8, 2018. ^ "Apollo crew warned about commercialism". The Free Lance-Star. August 1, 1972. Retrieved August 26, 2011. ^ "Apollo 17 Crew". The Apollo Program. Washington, D.C.: National Air and Space Museum. Retrieved August 26, 2011. ^ a b "John Young". Astronaut Scholarship Foundation. Retrieved January 6, 2018. ^ a b "STS-61-J". Encyclopedia Astronautica. November 17, 2007. Archived from the original on January 8, 2010. Retrieved March 31, 2010. ^ Dunn, Marcia (January 6, 2018). "NASA: Legendary astronaut, moonwalker John Young has died". ABC News. Archived from the original on January 6, 2018. Retrieved January 6, 2018. ^ "The Nation". Los Angeles Times. April 16, 1987. Retrieved January 6, 2018. ^ "Top Astronaut Says NASA Forced Him From Job". Los Angeles Times. July 30, 1987. Retrieved January 6, 2018. ^ Fuglesang, Christer (2007). Tretton dygn i rymden efter fjorton år på jorden: dagbok från rymden [Thirteen days in space, after fourteen years on earth: a diary from space] (in Swedish). Albert Bonniers Förlag. ISBN 978-91-85555-15-4. OCLC 185242561. ^ Ryba, Jeanne (April 7, 2006). "To honor the 25th anniversary ..." NASA. Archived from the original on May 31, 2010. Retrieved October 6, 2011. ^ "Forever Young: A Life of Adventure in Air and Space". University Press of Florida. Retrieved May 9, 2013. ^ a b Associated Press (April 11, 1981). "Young: America's old man of space". Nashua Telegraph. 113 (36). p. 23. ^ "NASA Remembers Agency's Most Experienced Astronaut". NASA. January 6, 2018. Archived from the original on January 6, 2018. ^ "John Young, ninth astronaut on moon, led first shuttle mission, dies at 87". collectSPACE. January 6, 2018. Retrieved January 6, 2018. ^ Pearlman, Robert Z. (October 25, 2018). "Space Station-Bound Cargo Ship Named for Moonwalker John Young". Space.com. ^ Volz, Brianna (January 6, 2018). "Astronaut John Young, who grew up in Orlando, dies at 87". WKMG. Retrieved January 24, 2019. ^ Kelly, Scott (2017). Endurance: A Year in Space, a Lifetime of Discovery. With Margaret Lazarus Dean. Alfred A. Knopf, a division of Penguin Random House. p. 201. ISBN 9781524731595. ^ a b c d e f g h "Historical Recipient List" (PDF). NASA. Retrieved January 8, 2018. ^ "Biography: 2 Exceptional Service Medals". JohnWYoung.org. Retrieved May 14, 2013. ^ "The General James E. Hill Lifetime Space Achievement Award". National Space Symposium. 2010. Archived from the original on June 15, 2013. Retrieved May 14, 2013. ^ Stevens, Janet (January 22, 2010). "Legendary Astronaut John Young to Receive General James E. Hill Lifetime Space Achievement Award" (Press release). National Space Symposium. Archived from the original on June 15, 2013. Retrieved May 14, 2013. ^ "Golden Plate Awardees listed by year". Academy of Achievement. Retrieved January 6, 2018. ^ "Captain John W. Young". Georgia Aviation Hall of Fame. Retrieved October 9, 2018. 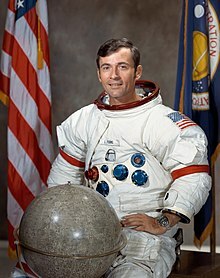 ^ "NASA Names Astronaut John Young Ambassador of Exploration". NASA. Retrieved January 6, 2018. ^ "11th Annual John Young History Maker Celebration" (PDF). Historical Society of Central Florida. Retrieved January 6, 2018. ^ "John Young Elementary School Homepage". John Young Elementary School. Retrieved January 6, 2018. ^ Schreuder, Cindy (October 28, 1990). "Where Stargazers Can Get The Big Picture". Orlando Sentinel. Retrieved May 14, 2013. ^ Hively, Carol (October 27, 2010). "Space Foundation Survey Reveals Broad Range of Space Heroes; Early Astronauts Still the Most Inspirational" (Press release). Space Foundation. Retrieved May 14, 2013. ^ "Aviation Week's Laureate Awards Past Winners". Aviation Week. Retrieved January 6, 2018. ^ a b c "Biography: Organization Memberships". JohnWYoung.org. Retrieved May 14, 2013. ^ "Astronauts and Scientists". Tau Beta Pi. Retrieved January 6, 2018. ^ Francis, Arthur Morius (February 20, 2015). "2". Secret Societies Vol. 3: The Collegiate Secret Societies of America. Lulu.com. p. 26. Retrieved January 6, 2018. ^ "The Sigma Chi Museum". Sigma Chi Fraternity. Retrieved January 6, 2018. ^ "Apollo 13, Full Cast and Crew". IMDb. Retrieved December 5, 2017. ^ "In the Shadow of the Moon: Full Cast and Crew". IMDb. Retrieved January 6, 2018. ^ "The Wonder of It All: Full Cast and Crew". IMDb. Retrieved January 6, 2018. ^ "When We Left Earth: Full Cast and Crew". IMDb. Retrieved January 6, 2018. Thompson, Neal (2004). Light This Candle: The Life & Times of Alan Shepard, America's First Spaceman (1st ed.). New York: Crown Publishers. ISBN 0-609-61001-5. LCCN 2003015688. OCLC 52631310. Wikimedia Commons has media related to John Young (astronaut).